A few weeks months ago I was shopping with my mom and friend/brother-in-law’s girlfriend, Andrea at the outlet mall. My mom had recently discovered Crabtree & Evelyn’s new nail polish line, and if you know Helene, you know that she loves a good bottle of nail polish. While perusing C&E’s new nail polish that day the salesman pointed out a new nail product: nail polish removing wipes. Allegedly one wipe could take the nail polish off all your fingers – and they were good for your nails unlike typical nail polish remover. I’m a sucker for spiel and listened intently as he talked about it’s benefits and showed us their newly formulated hand lotions until several minutes later Helene stepped in and ushered us all to the check-out counter (I believe this was after Andrea and I received hand massages with that newly formulated hand lotion haha). The spiel worked and I left having purchased the nail wipes, a bottle of nail polish and some new hand lotion (I did need the lotion for my purse, my hands were pretty dry by that point in winter). 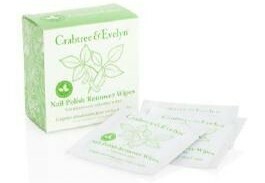 About a week later, I tested out the nail wipes while removing nail polish from my finger nails, and it definitely lived up to my expectations – one wipe took the polish off all 10 fingernails. A few weeks later, while Mike was working on my desk (see the post The Desk that Mike Built) his hands became covered in stain. As did most of his lower arms. I came home from work to see him scrubbing in the sink – but to no avail. I intervened when I saw him bring out the steel wool. First we tried a Fresh Brown Sugar Scrub sample that I had in my bathroom drawer. That didn’t really do anything to take the stain off of his hands/arms. Then I had another idea, I grabbed one of the nail polish removing wipes and suggested that he try that instead. I figured that since it’s made to take a varnish off of your nails, maybe it would take a stain off of your skin. And it did. Though it did take two to get the job done (which I suppose is pretty good considering that Mike’s hands/arms take up considerably more space than my 10 fingernails do). As he continued to stain, he continued to use the wipes afterwards to clean his hands/arms. And then there was one. One wipe left (the box comes with 8). While shopping at the outlet mall a few weeks later with my sister Tory I decided to stop in C&E to pick up another box of the wipes. I’m a chatty person (this probably comes as a shock) and so I told the saleswoman about how Mike had used up the box of wipes cleaning stain off of his arms as she rung up my purchase (just the wipes this time).